New Titanium Exhaust Systems for the K1200S and K1200R. 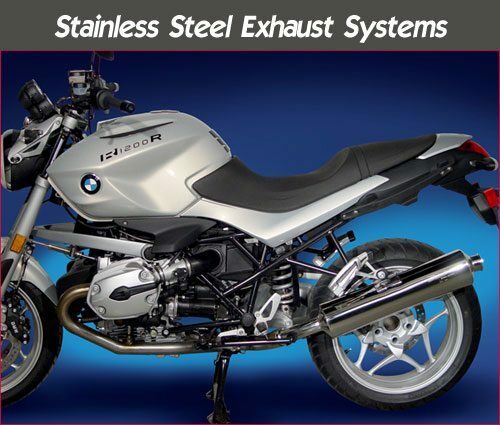 Take a look at the new Z4003 Performance Exhaust System for the BMW R1200R/ST/RT. This sleek exhaust consistently provides a performance boost of 5 HP and 2 ft. lbs. of torque in a lightweight, well-engineered package. A close look at the quality shows no short cuts taken – the craftsmanship of the entire system is refined for power and appearance. Equal length header pipes feature precision machined and welded couplers, providing you the benefit of a perfect fit and a tight, long lasting seal. The polished stainless steel muffler also features a removable dB Killer™ for an aggressive sound to match its performance. 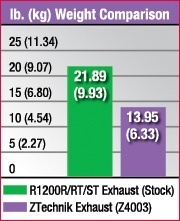 The Z4003 Performance Exhaust System weighs 8 lbs. less than the OEM system, has a slim, refined profile, and works with the stock centrestand. As with all ZTechnik Exhaust Systems, your engine warranty remains valid after the system is installed!